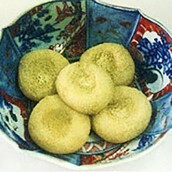 Tofu pickled with plum vinegar used to be a daily food when there were no refrigerators. 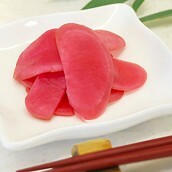 It is thinly sliced when eating as it is very salty. 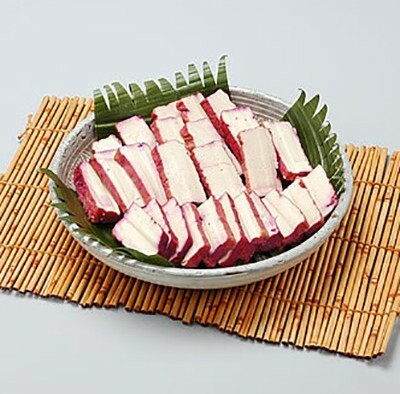 It was named as “tsunoyama cheese”, a name that young people can feel familiar, when it entered the “First Tsunoyama Processed Food Competition” held in 2002 by the Women’s Tsunoyama Fishery and Farming Group for the objective to develop processed food using local products. 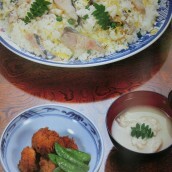 It won this competition and was met with enthusiastic reception. Cut the tofu into 1/4 thick. 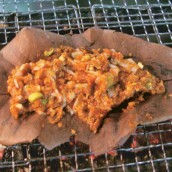 Spread a cotton cloth on a pile of newspapers, place the tofu on top, and cover it with another cloth and newspapers. 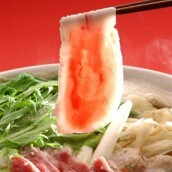 Make several layers, put weight on top with a cutting board, and leave for 1-2 hours until the water is removed. Bake both sides of the tofu with charcoal. Turn it many times until golden color. 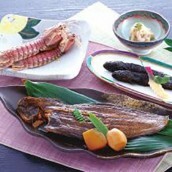 Soak 2. into plum vinegar and leave for 1 week to 10 days.Being a preserved food, it is very salty. This should serve for about 20 people.The amount of salt to the plum vinegar is 20%.The key is the baking method. Make sure to turn it many times and not to burn, or it will become black. 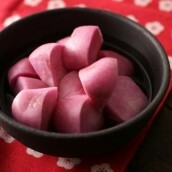 The golden color will become bright pink when soaking it in plum vinegar.